The Kukulkan pyramid has recently been announced and ranked on the list of new wonders of the world and is an unexpected discovery in the history of the Mayan world. The most emblatic site in Yucatan CHICHEN ITZA has not yet revealed all of its mysteries. 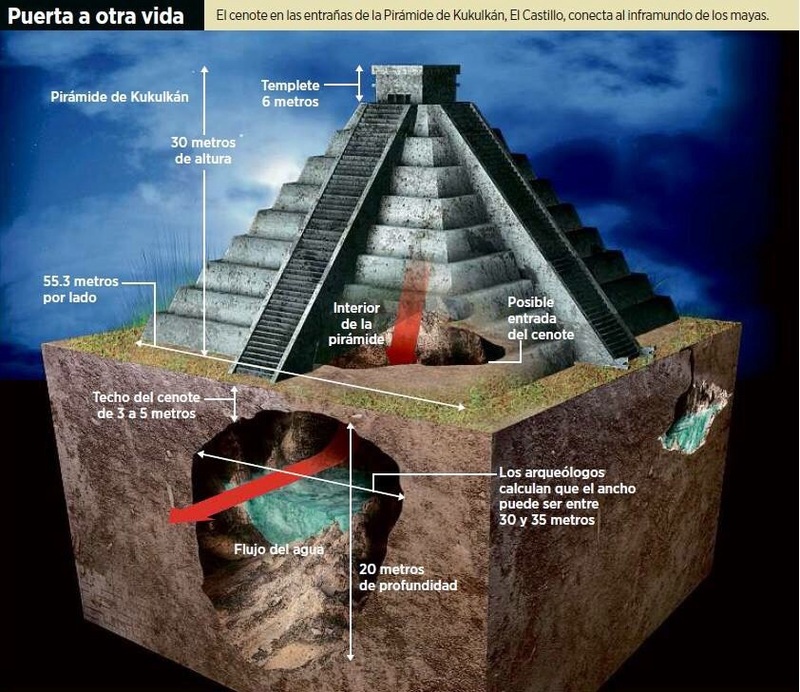 In the month of August of 2015, Rene Chavez, a researcher at the Geophysical Institute of the Autonomous University of Mexico (UNAM) announced the discovery of a huge CENOTE beneath the pyramid KUKULKAN also known as “el Castillo”. Up until recently, we knew that there was an underground river beneath a small pyramid at the site, but no one imagined that there was such a large reserve of water in the structure. Researchers are now asking how the ancient Mayans were able to build such a large and heavy building above a cenote without it collapsing. … Discovering how will help archaeologists advance in what they know about the Mayan culture. What we do know is that we are far from knowing all the secrets of the Mayan people. If we didn’t know what was in the temples of the most famous archaeological site in Mexico, we imagine that there is still a lot to learn about the other sites in the Mayan world. For the pre-hispanic Mayan, cenotes were sacred places with access to what is called “the underworld”. There have been several human skeletons and offerings found in the great sacred cenote of Chichen Itza. The archaeological site of Chichen Itza is open for visitors all year around. Fans of Chichen Itza can spend several hours visiting the site and come back repeatedly, always discovering something new. … The oldest part of the ruins will soon open its doors to visitors. Since June we can now witness an amazing show of light and sound projected onto the pyramid at night. Soon, we will see new discoveries!